Sorry but it takes two weeks for this update. I thought I could do implement some more features as I did, but there was only a little time during the two weeks. You will find this button on every menu of the editor. It provides the moving of these menus. But I have to say that it is not very useable, because you have to stick over the button by moving the mouse. Do you imagine what Complex-Objects are? They are a summarizing of typical 3D-Objects. 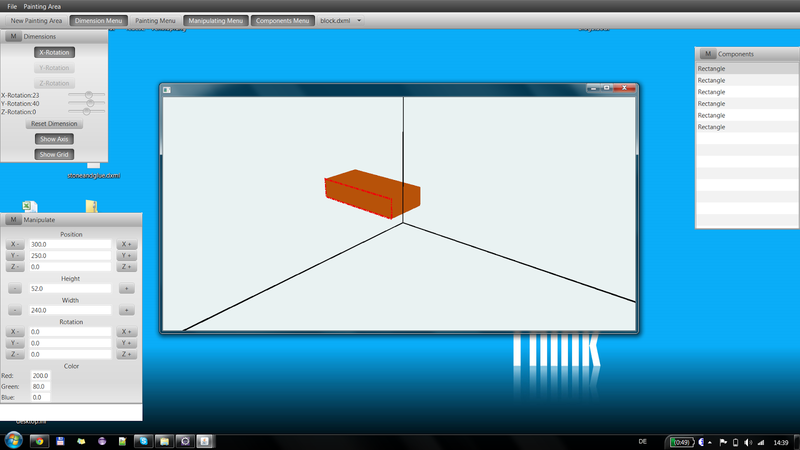 Because of the different properties of 3D-Objects, Complex-Objects only have position- and rotation-properties. If you remember the manipulation-menu contains the properties of the selected 3D-object and the list of all used 3D-objects in the painting-area. These two different view are separated now. You will find the list of 3D-objects into the "Components Menu". If you do a right-click into the "Components Menu" you will see a contextmenu. There you can copy, paste or delete the selected components. Mutliselection is also availeble. But there are several bugs in this release, so pay ATTENTION! If you selecte more than one component you can put them in a complex-object by opening the contexmenu and choose "summarize". Axis are avalileble for the second time! If you have an look at the "Dimension Menu" you will see two new buttons. The button "Show Axis" obviously will show the x-, y-, and z-Axis in the actual painting-area. The other button "Show Grid" shows not a grid for now. It shows the three levels between the axis. I hope that I don't forgot some new features. Otherwise you will find them on your own. Have fun with the editor and play or model some 3D-graphics. Send me what you have done by email, please. You also can send me some bugs and errors - I know there are many of them. But I'm not ready yet.